I’m not an ice cream person but my husband lives on it. We have purchased many scoops over the years only to be disappointed. He loves this one so much I ordered 2 more. One for a vacation home and one for our son and his family. 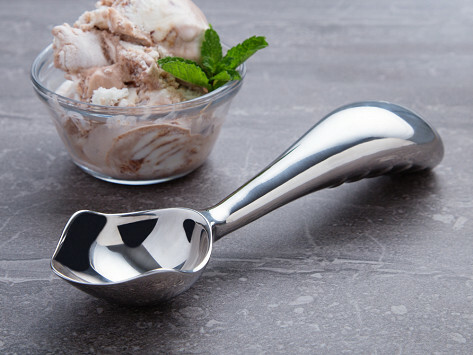 I love this ice cream scoop so much that I’m giving one to all of my best friends for their b-days or for hosting me for a visit or for Christmas....any reason to give a gift. Or for no reason at all!!!! I absolutly love this wonderful scoop. Again you folks are amazing. Thanks for helping us get that ice cream so much easier. I enjoy making ice cream at home and I had tried so many different type of scoopers never satisfied until I get this one. Worthwhile! Used to own an ice cream store with 48 flavors of hand dipped ice cream. So I know what I'm talking about when I say this really works! Looks great and works well too. It is a little hefty for an ice cream scoop but absolutely gets the job done. No matter how hard the ice cream may be this nifty scooper can handle it. It's definitely ergonomic! THIS ICE CREAM SCOOP IS EVERYTHING YOU SAID IT WOULD BE! IT'S SO WELL BALANCED WITH THE BEAUTIFUL AND ERGONOMIC HANDLE. I COULDN'T GET HARD ICE CREAM OUT OF THE CONTAINER BEFORE, BUT THIS SCOOP MAKES EASY WORK OF IT. 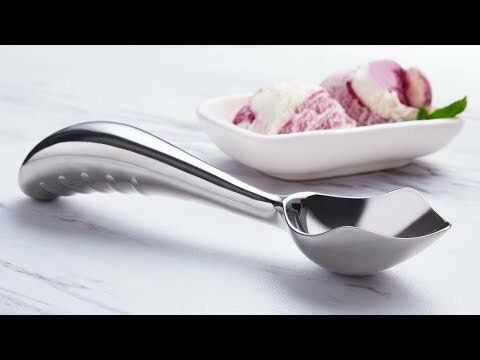 THE ABSOLUTELY BEST ICE CREAM SCOOP EVERY!!! Aerospace engineer Michael Chou designed a space-grade, ergonomic ice cream scoop that lets you enjoy ice cream right out of the freezer—without straining your wrist. Midnight Scoop, appropriately, looks a little futuristic, with a curved handle and tapered scooper that glides right through that pint of Strawberry or Double Fudge Cookie Dough. Behind Michael’s design are some smart physics—letting you use your arm muscles, which are way more up to the treat-scooping task, than your less-sturdy wrist muscles. Michael’s a-ha moment came to him during one of his many sessions serving up ice cream for his kids. He realized that, in order to protect his wrists, he had been pushing into the ice cream while keeping his wrists straight.